(Left to right) Mobile County Master Gardener Marie Dyson tree planting at Shaw High School. Mobile County Master Gardener Brenda Bolton makes centerpieces for the Greenery Sale. Master Gardeners Peggy Wright and Nina Ward make bows for the Greenery Sale. After reading our “Ask a Master Gardener” column, you may find yourself wondering how you can become a part of our local Master Gardener group. Luckily for you, we will be accepting applications for the Master Gardener program very soon. The Master Gardener program is a volunteer training program offered through the Alabama Cooperative Extension System. The purpose of the program is to increase the availability of home horticulture information to residents of our community through qualified volunteers (Master Gardeners). This program is an active partnership between the Extension service and motivated volunteers interested in educating our community with research-based information. This is more than your average gardening program — all the techniques and information we teach are backed up by research. This course covers many topics in gardening and horticulture, including soil science, fruits and vegetables, and smart home landscaping practices. Some say it’s almost like getting a horticulture degree in just 15 weeks! The volunteer component of being a Master Gardener is just as important as the class component. We want volunteers-in-training who are passionate about sharing research-based information with our Mobile community to help improve our citizens’ quality of life. To become a certified Master Gardener, you will need to complete 50 hours of volunteer service within a year of completing the course. There are multiple opportunities to volunteer as a Master Gardener through various activities, including staffing our home horticulture helpline, working in our DREAM demonstration gardens at the extension office and other community outreach activities. Once you have completed the class and the initial 50 hours of volunteer service, you will become a certified Master Gardener, which means you will officially be a part of the Mobile County Master Gardener Association and the Alabama Master Gardener Association. With certification comes the opportunity to purchase your own coveted green Master Gardener apron. As a member of MCMG, you will be able to choose the volunteer activities that best suit your interests and continue to work with Alabama Extension in its mission to deliver research-based educational programs. Perhaps you have a passion for teaching about vegetables, or roses, container gardening, irrigation practices or anything related to horticulture. If that’s the case, you might be a perfect fit in the speaker’s bureau, made up of Master Gardeners who give presentations throughout the community. Maybe you like to solve home gardening problems; if so, the helpline is always looking for help. We also have plenty of opportunities to get your hands in the dirt at our DREAM gardens, community gardens and school gardens. 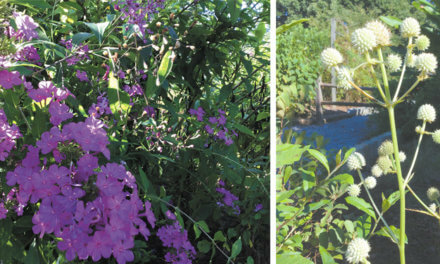 The Master Gardener training course will meet Wednesdays from 9 a.m. to 2:30 p.m. beginning Aug. 8 and ending Nov. 14. The cost of the 15-week course is $160 and includes a handbook, publications and access to a network of professional extension personnel and other Master Gardeners. If the price is prohibitive for you, we offer a limited number of scholarships to interested individuals each year. The Alabama Cooperative Extension System (Alabama A&M and Auburn University) is committed to affirmative action, equal opportunity and the diversity of its workforce. Educational programs serve everyone. When you are ready to sign up, please call our office at 251-574-8445 to get on the mailing list for applications. Application packets will be sent out in just a couple of weeks, so don’t miss out. You can find out more about the Master Gardener program at mg.aces.edu. The application deadline for this fall’s class is June 6, so reserve your spot. We look forward to meeting and learning with you! Wednesdays, 9 a.m. to 2:30 p.m.
For more information call 251-574-8445. Master Gardener Helpline: 1-877-252-4769 or send your questions to coastalalabamagardening@gmail.com. PreviousTheme: Memorial Day weekend. Roll it! NextHow many national titles has Alabama won?